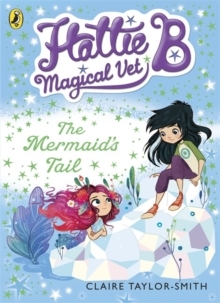 Hattie B, Magical Vet: The Mermaid's Tail (Book 4), is the fourth title in a brand new magical series for girls!Discover a secret world of fairytale creatures! Another creature needs Hattie's help in the Kingdom of Bellua!This time a mermaid has lost the colour in her tail, and Hattie knows who has stolen it - evil King Ivar of the Imps. Hattie must travel across the desert to collect the mermaid's medicine. Will she make it back in time to save her?Hattie B is inspired by a little girl called Harriet, who once asked 'where do unicorns and dragons go when they're unwell?' Her mum, Lindsay Taylor, and their friend, Suzanne Smith thought long and hard and suddenly realised - a magical vet of course!